While people often flock to the Gorge to see waterfalls that plummet over one-hundred feet, there are some who visit the Gorge seeking a different type of natural giant. Hood River photographer, Darryl Lloyd searches the Columbia River Gorge for old-growth trees. 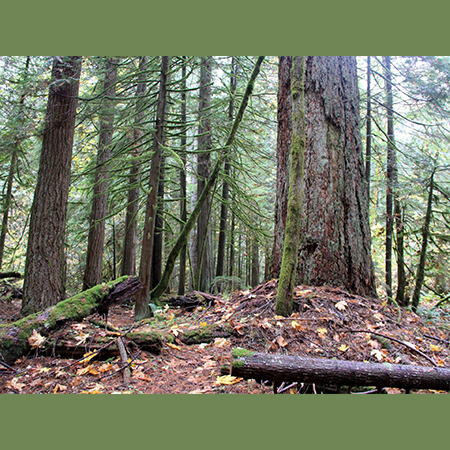 In the Gifford-Pinchot National Forest he frequents an old-growth forest, which Lloyd has named "Giants Trees of Lost Creek," with Douglas-firs and Western Red Cedars that are taller than many of the Gorge's waterfalls. The most impressive is a Douglas-fir roughly 243 feet tall and almost 9 feet in diameter. The cedars are almost as impressive, growing in thick and ancient groves along the creek, with the largest almost 10 feet in diameter. While the secret old-growth stand was historically protected from a proposed timber sale in 1990 by an activist, Russ Jolly, Lloyd has recently brought more attention to the Giant Trees of Lost Creek. Lloyd's reasoning is that even with the original timber sale beaten back, the grove never received any official protection. It's located just outside the national scenic area on land classified as “matrix” under the Northwest Forest Plan. Matrix lands are designated for timber harvest, with no limits on the size of trees that can be cut. He worries it could be logged at any time. Oregon Wild conservation director Erik Fernandez agreed.